Mother Olga of the Sacred Heart is the founder and mother servant of Daughters of Mary of Nazareth. She lived through four wars in Middle East. In 1993, as a young lay woman, she started a lay movement called Love Your Neighbor. She invited young men and women from Christian and Muslim communities to be part of this community to serve the needs of the poor in a war-torn area. 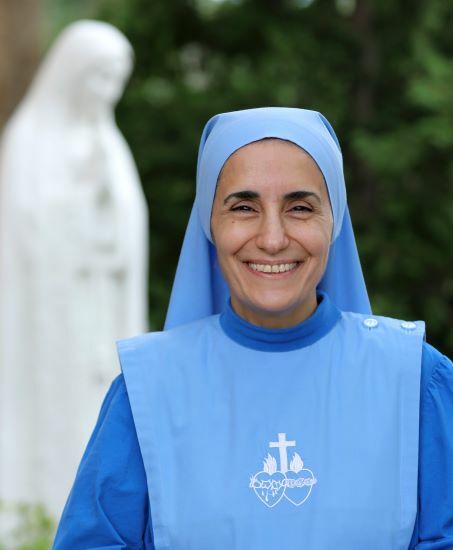 In 1995 she established the order of Marth Maryam Sisters- Missionaries of the Virgin Mary, the first order for Religious Sisters in the Assyrian Church of the East in 700 years. In her homeland Mother Olga was involved in pastoral ministry for the college students and youth in the parishes. She also served the prisoners, homeless, elderly, and handicapped of war for many years. The Minister of Public Health gave her the Humanitarian Award for her service to the poorest of the poor there. She has a BS in Biology and Hematology and a MA in Philosophy and Theology from a college that is affiliated with the Pontifical Urbaniana University in Rome. She also has a certificate in Theology of The Body. She came to the United States in 2001 for her studies where she received her master degree in Pastoral Ministry from Boston College. From 2002- July 2011 she was involved in the campus ministry of the Catholic Center at Boston University. From July 2010- July 2011 she was named the University Chaplain for the Roman Catholic community at Boston University. She was received into the Roman Catholic Church on September 8th 2005, in the Archdiocese of Boston. Cardinal Séan Patrick O’Malley, OFM. Cap. received her perpetual vows on December 8th 2005. In April 2008, she received the award of the Religious Sister of the Year at the 2008 Boston Catholic Women’s Conference. In April 2010, she received ‘Saint Paul the Apostle Award’ from the office of the New Evangelization of Youth and Young Adults of the Archdiocese of Boston. In May 19, 2011, she received an honorary Scarlet Key Award from Boston University. In February 2012, she received the Bowie Kuhn Special Award for Evangelization at the Legatus 2012 Annual Summit. On November 29, 2015, Cardinal Séan presented her with the Cheverus Award at the Cathedral of the Holy Cross. In May 2018, she received the Assyrian American National Federation Humanitarian Award and on October 2018 she received the Saint Edmund’s Medal of Honor. In summer 2009, Cardinal O’Malley gave her the permission to start a new apostolate on the Boston University campus called the Nazareth House. It was a house of prayer and discernment for young women. In April, 2011, Cardinal Séan Patrick O’Malley, entrusted to her the mission of establishing a new religious community of sisters in the Archdiocese of Boston, Daughters of Mary of Nazareth.